The Pi In The Sky boards include an onboard temperature sensor, but can be expanded by adding various external sensors. Many suitable devices are available at low cost from Sparkfun etc., allowing you to monitor external temperature, pressure, humidity, UV etc. 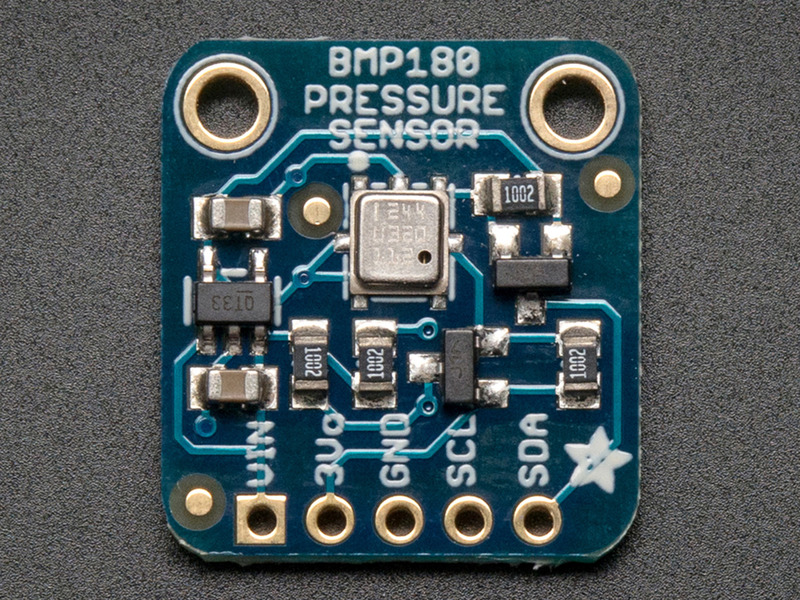 The supplied software supports the BMP085 and BMP180 pressure/temperature sensor but of course you can add any I2C device and write your own software to access it.. The BMP085 is obsolete now but the BMP180 is a slightly better and compatible device. RED - Positive power - labelled "Vin" or "+" or "Vcc"
BLACK - Negative power or Ground - labelled "GND" or "-" or "0V"
Using separate colours makes a mistake much, much less likely. Red and Black are standard colours for "+" and "-"; the others can be anything you have to hand. This particular board has an extra "3V" connection which is not used. So it's a very straightforward connection. If you wish, rather than a permanent connection, you can place pin headers on the either or both boards and make up a cable with plugs to fit the headers. If you do, make sure that the connection is firm and cannot come loose during flight. Finally, the software needs to be told to use the new sensor. To do this, add "enable_bmp085=Y" to the configuration file /boot/pisky.txt (see http://www.pi-in-the-sky.com/index.php?id=configuration for details).